It’s no secret that I’m a longtime fan of My Morning Jacket, if you want to know about the transcendent power of rock music there are currently few finer live bands and certainly they are in my top three live acts I would recommend to any music fan (full list coming soon). For my money their 2005 John Leckie produced album Z was pretty much faultless, although many fans prefer the reverb soaked, recorded-in-a-grain-silo sound of their first two albums and the major label debut It Still Moves, Z is the one that finally comes closest to capturing the full extent of their majesty (although the live album/dvd Okonosos is probably the best starting point for new fans). So the release last year’s eagerly awaited follow up Evil Urges was something of a disappointment. Whereas in the past they’ve successfully implemented elements of reggae (Phone Went West) and ska (Off The Record) and they’ve always had a lot of soul, the funk, r’nb and falsetto experiments found the band misfiring. That and a few slight songs with cheesy lyrics marred what otherwise should have been the album that crossed over. 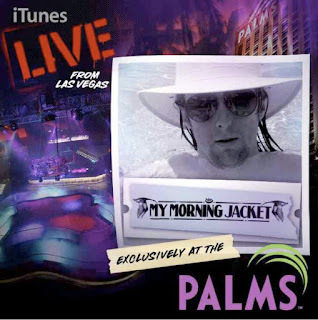 Skip forward seven months to this iTunes only curio recorded live in the state of the art Palm Casino studio in Las Vegas. There’s a suitably lounge-tinged feel here that, given the city’s place in the whole rat pack mythos, seems appropriate. This cocktail vibe is enhanced by picking five of the more laid back and quieter tracks from either end of the band’s catalogue to date, which gives the six song EP a consistency that it might otherwise be lacking. Opener Tonight I Want To Celebrate With You employs the omnichord that worked to such great effect on Touch Me I Think I’m Going To Scream Pt 2 , but rather than go with the latter’s gentle electro groove it takes on a country flavour with some pedal steel guitar. It’s this country rock and cocktail theme that runs through all the tracks here, bringing out the AM friendly side of the band, and although it’s certainly not the reason why I love the band it is something they do well, and stripped of the wailing guitars it serves to showcase the quality of Jim James songwriting. New tune Dear Wife could happily have sat along side the better tracks on the last album but the standout is the Tennessee Fire‘s They Ran, a lesson in restraint with sweet wordless, backing vocals that to these ears has the same feel as The Flamingos version of I Only Have Eyes For You. As a companion piece to Evil Urges it’s a strong offering (and at only £4.74 a bargain), although fans of the band’s more rocking side (assuming they already own Okonosos) may want to check out some of the recordings from the Madison Sqare Garden NYE show as well. That and keep your fingers crossed for rescheduled UK dates. This entry was posted in My Morning Jacket, Review by nickpeters. Bookmark the permalink.